To close out the week, we have another Newsgraph generated from the Bitpress network of articles. Publications linking to today’s top trusted stories rated with BitpressRank. While Bitpress aims to identify misinformation, this is not always as black and white as purely fabricated content. 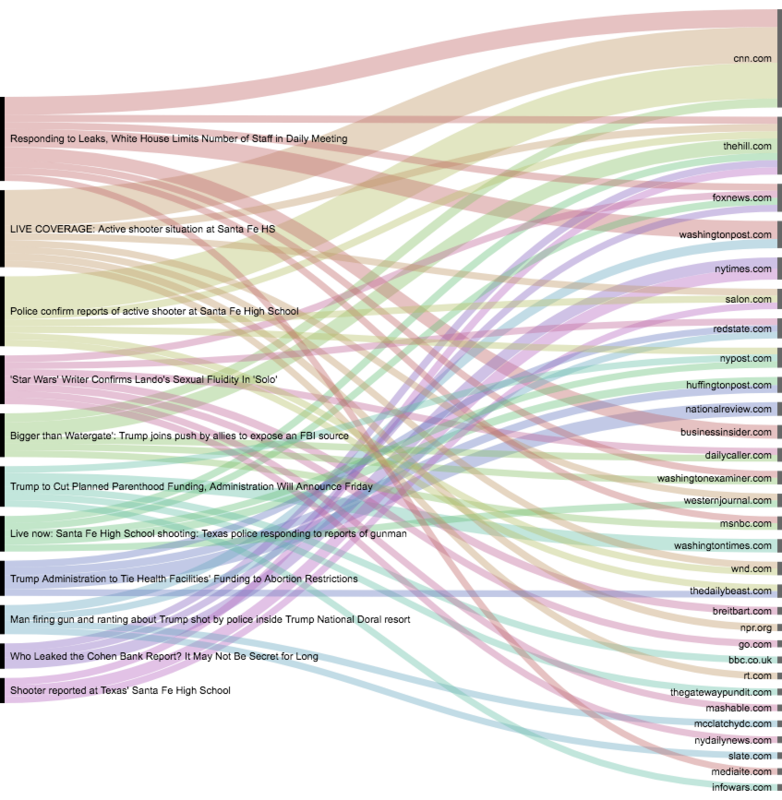 Using the Bitpress network of links between articles, we are able to analyze and identify trends in media coverage. Whether you’re aware of it or not, the publishers you turn to for news may not be telling you the whole story. We’ve classified the bias of publishers in our network utilizing data gathered from Media Cloud. In our Highlights and Trends section we’ll point out which stories are receiving uneven coverage across the political spectrum, those that are agreed upon on both sides, and other trends in reporting. We believe that an informed democracy should understand all sides of the story; it’s time to break out of the echo chambers. We have three stories that we’re highlighting today. A Huffington Post story discussing the sexual fluidity of a character in the Star Wars universe gained significant popularity today. Though the Huffington Post is left-leaning, 83% of the links to the story were from conservative sources. Most of these sources, including Breitbart, appear to cover the article neutrally. However, a disturbing trend can be uncovered in the toxic comment sections. When the underrepresentation of inlinks from liberal publishers is noted, it seems that this coverage may be intended to incite anger from the readers of these publications. The New York Times published an article saying a TV show with Michael Avenatti and Anthony Scaramucci was being presented to CNN/MSNBC executives, citing unnamed sources. What followed was a series of follow up stories and denials by other news outlets. The Hill published that they were unable to verify the NYT story. While we don’t know which side of the story is correct, it’s important to note that the sources in both stories were unnamed. A reader should be aware of this context and understand that the standards for vetting and citing anonymous sources vary between publishers. Both stories are from local, Houston-area sources. This is a positive trend that we see when local news reaches national interest. Local sources often have better understanding of the community, and local publishers are considered to be more trusted than national organizations. Thanks for reading today’s insights; check back next week for more Newsgraphs.